(5mins) Go right on Long Acre; turn left at Drury Lane and you&rsquo;ll see the theatre 100 metres away on a corner. Latest Review: "Went to see last night and it was fantastic worth every penny that you pay..."
In 2003, cinemas were set alight with the film School of Rock, with Jack Black playing musician-turned-substitute-teacher Dewey Finn. 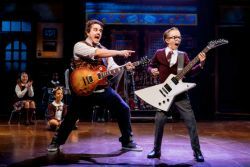 Brought to the stage by Andrew Lloyd Webber, School of Rock premiered on Broadway in 2015, later transferring to the West End in 2016 where it has enjoyed a rocking run. 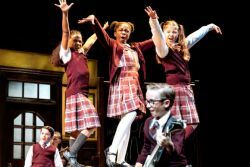 Guitars, drums and killer piano solos are at the heart of School of Rock, where the kids of Horace Green perform rock songs of seismic proportion. So if you’re looking for a gut-busting show to blow your mind, you’ll want to book your tickets for School of Rock. In the first few minutes of the show starting, you’ll meet wannabe rock star Dewey Finn as he’s just been kicked out of a band. Down on his luck, it seems as though his life is going nowhere. But, when he picks up a phone call from Horace Green Preparatory School calling for Ned Schneebly, Dewey adopts Ned’s name and finds himself in a new job. Lucky for some! When the job starts, it’s clear that Dewey isn’t up to scratch. But, hearing his class in a music lesson, he seizes the opportunity to form a rock band of his own to compete in Battle of the Bands. Creating his own curriculum, the kids learn all about how to perform. Will the kids be caught? Will they win Battle of the Bands? You’ll have to watch the musical to find out, but there’s no way you can stop the School of Rock. The musical features an original score inspired by the film, including “Math Is A Wonderful Thing” and “Stick It To The Man”, but the crowd turns electric when they hear the finale. Don’t worry about being a teacher’s pet and turn up the heat at School of Rock. The original film was directed by Richard Linklater and in addition to Jack Black, the cast also included Joan Cusack and Sarah Silverman. Black was nominated for a Golden Globe for his performance as Dewey Finn. 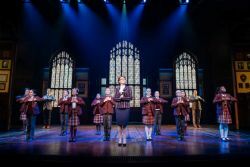 The production won the 2017 Olivier Award for outstanding achievement in music, awarded to the children of Horace Green who play the instruments live on stage! School of Rock plays at the Gillian Lynne Theatre, named after the choreographer Gillian Lynne who choreographed The Phantom of the Opera.